Since 1936, Camp Quinebarge has provided children ages 7-15 with summers of fun and friendship. 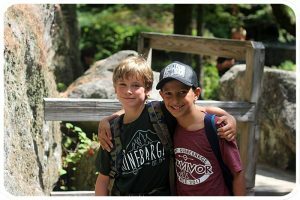 We offer an all-around summer camp experience, with camper’s choice activities, hiking excursions, overnight trips, and specialty onsite programming unique to Quinebarge. Our campers return home with newfound confidence, life and activity skills, fun memories, and friendships to last a lifetime. 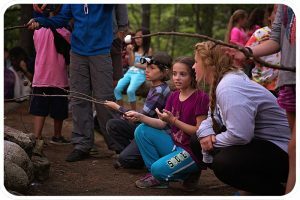 We believe that part of the summer camp experience should include camping or overnight trips, and our program provides such opportunities for campers of all ages. Younger groups camp out with their cabins on our Monkeytown platforms or at our onsite tenting area. Songs and silly stories are shared around the fire, and campers enjoy s’mores before stargazing and hitting the hay. Cabins of older campers and overnight hiking groups stay at local campground, state parks, or in Appalachian Mountain Club huts for a bit more adventure. Our overnights are always led by Quinebarge counselors, and allow for a bit of adventure. 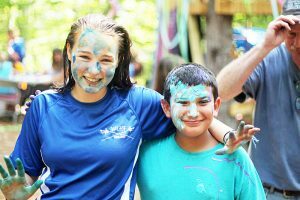 Year after year, our campers return because of the fun they have and friends they’ve made at camp. There are no friend like camp friends. Campers bond through shared experiences, triumphs, and adventures, and leave Quinebarge with lifelong friends. Our counselors are trained to foster friendships, mutual respect, and kindness, resulting in a close-knit community. Whether they stay for one session, or return year after year, Quinebarge alumni’s friendships are everlasting.